Arsene Wenger continues his transfer politic and unsurprisingly aimed yet another young prospect to sign in January. Arsenal midfield leaders Aaron Ramsey, Jack Wilshere, Mikel Arteta and Thomas Rosicky still struggling from injuries and the Gunners need reinforcement at midfield. French tactician has already sent spies to watch the highly-rated Mohamed Elneny, who plays as defensive midfielder at FC Basel. The 5”11” player was one of the best performers at Super League this term. Elneny Totally made 23 appearance for Swiss club, scored 3 goals and made 2 assists in all competitions. He is known for his passing accuracy, his ability to set up goals, as well as his long shots. 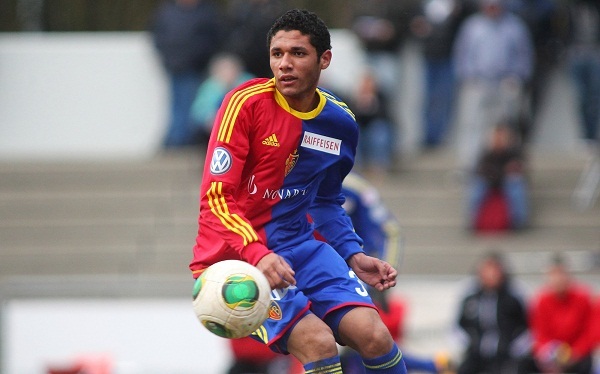 Elneny has been described by Basel manager Urs Fischer as “perhaps the archetype of the modern midfielder”. At the age of just 23, creative starlet is a permanent member of Egypt national team and managed to score 2 goals in 35 matches for his country. It’s believed that Wenger marked the talented midfielder as a replacement of the Spanish captain Arteta, who is on his way to leave the Emirates. Serbian defender Branislav Ivanovic came to meet Jaden, a year nine student from the Football Beyond Borders Schools project, dressed in a club hoody and jeans, a look that did not reach the youngster’s high sartorial standards. Chelsea right-back was hilariously and emphatically put down by a school child in a video you can watch below. “If I did mess up a little bit, he would convince me to carry on. “Even though I’m Manchester United all the way, I can see that Chelsea have some great players on and off the pitch!” – he added. The Turkish giants Besiktas are close to land Albania international Armando Sadiku in January, as they have already made a bid for versatile striker. However, Manchester United are also monitoring the situation around highly-rated Zürich forward and are planning a move in upcoming transfer window. The 24-year-old forward has been impressive this term, scored 8 goals and made one assist for Swiss club at Raiffeisen Super League. While, Besiktas as well as the Red Devils need an reinforcement in attack and in-form front-man could be an ideal signing for them. Sadiku is a 6”1” target-man who is also able to play as a winger, he is described as having an eye for the spectacular and is capable of perfect skills and being a technically proficient, highly successful striker. He has the ability to find himself in goalscoring positions, using his pace and vision to get in behind defenders.